My best friend asked me to write something about Sweet-peas, so here goes. 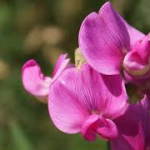 The sweet- pea represents ‘delicate pleasures’ and that is exactly what the sweet smelling aroma of sweet-peas is like. In early August they reward us with a multitude of colours including red, blue, lavender, pink and white and can also be streaked or bicoloured. Enchantment in the garden in Spring, when most other flowers are still re-awakening after winter’s rest. 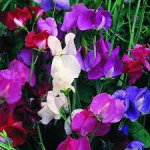 Planting tips Sweet- peas love a warm sunny spot and should be planted at the end of winter in beds which are either north or east facing to ensure that the plant get the maximum amount of morning sun each day, for strong healthy flowers. 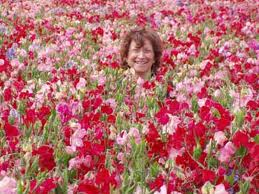 Prepare a trench the length of the bed you are going to plant your sweet- peas in, and about 60 centimetres wide. Remove the top 30 centimetres of soil in the trench and put it to one side. Loosen up the soil left in the trench to a depth of 30 centimetres. Mix the removed soil generously with compost and bone meal or super phosphate, return the soil to the trench and level it out. The taller varieties of sweet- peas will need a trellis to allow the tendrils to latch onto and save you having to tie them up later. Plant the seed at a depth of about 2 centimetres and about 10 centimetres apart, not closer. They will expend their energies fighting for space instead of producing flowers. Keep the trench moist but ensure the water drains well. Mice and birds might devour your seeds so protect your beds from them while the seeds are germinating. Plant Marigolds close to the sweet-pea bed to deter slugs and and snails.You can also protect your plants by placing crushed eggs shells around the base of each plant. Spray against Aphids. Of course ladybirds are the ultimate welcome guests in our gardens as they can chomp away at the aphids at an unbelievable rate. I was amazed at how suddenly I noticed these garden- friendly little red beetles in my garden last year, when my hibiscus’s were suddenly heavily infected with aphids. Red spider mites love sweet peas. To keep them at bay spray your sweet peas with water every day and dust them with sulphur every few weeks. That’s all there is to it! Have a lovely spring gardening spree. I wander’d lonely as a cloud That floats on high o’er vales and hills, When all at once I saw a crowd, A host, of golden daffodils; Beside the lake, beneath the trees, Fluttering and dancing in the breeze. A beautiful old fashioned poem, reflecting the peace and pleasure to be gained from gazing at a multitude of plants, even in a Musina garden, with our short lived Spring weather. 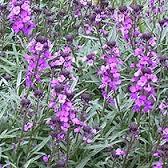 The Wallflower (Cheiranthus now Erysimum) is an old-fashioned garden flower, mainly evergreen, which blooms prolifically, producing a profusion of fragrant, brightly colored flowers from early spring to early autumn. Wallflowers grow well in full sun (early spring) or light shade later in the season, and should be planted in a well drained soil. Once established, it is durable and can survive with little watering. If transplanted while young, the plant will develop a thick, robust root system, and pinching the plant back often will produce a fuller, bushier plant. Regular feeding, trimming and deadheading will ensure abundant colourful flowers. Perennials can be propagated from cuttings taken from non-flowering stems. A new challenge to try in our gardens. Extend the beauty of your Spring garden by regular fertilizing, deadheading, and regular watering. Transplant or plant young trees, shrubs and climbers at the latest in early Spring to avoid transplant shock. Plant drought hardy sunny “Vygies” for a quick carpet of pink, orange, yellow and purple flowers in you rockery or west facing sunny parts of the garden. Prepare the soil for summer bulbs. Dig and loosen the soil, add compost and a handful of compost. Prepare hanging baskets and plant Begonias, Calibrochoa, Alyssiums and Petunias. Lightly prune your roses by pinching out some of the developing growth to extend flowing time and encourage leaf growth. Water roses regularly and watch for fungus and unwelcome beasties. Feed regularly. Cover with new mulch to keep the roots cool. If you don’t have a fish pond, enjoy the sprays of water from the sprinklers, and watch how the birds duck and dive in true happiness. I found these useful tips on organic remedies for the garden on the Internet, which I gladly share with my gardening friends: With the slight increase in humidity and warmth during August, I was dismayed to find powdery mildew on my beautiful, flowering Gerberas. Did you know that ordinary everyday things that you have in your kitchen, like milk, coffee, bicarbonate of soda, vegetable oils, detergent and white vinegar, can be mixed to make effective sprays for a range of plant problems. Milk fungicide. Especially as a preventative measure. – Organic (not longlife) milk. Stir one part of organic milk to 10 parts water. Spray to cover every part of the plant, both sides of the leaves and the stems. Stick to the one to ten mix, as too much milk will encourage sooty mould (like a black powder). This mix is excellent on cucumbers, begonias, roses, gerberas. Vegetable oil. As a fungicide on soft leaf vegetables, especially against powdery mildew, rust and black spot on roses. Mix 2 litres of water, a drop of vegetable oil, (which helps to fix the spray to the leaf when it’s dried) and a drop of detergent, which helps to spread the mix over the leaf, and two teaspoons of bicarbonate of soda, per litre water. The bicarbonate of soda makes the leaf surface alkaline and this inhibits the germination of fungal spores. Algae. One part of white vinegar and three parts water and simply spray on after it’s been mixed. The acid in the vinegar kills the algae. Coffee. Great against slugs and snails. Add one part espresso coffee to ten part of water. (Instant coffee is too weak). Spray this solution over the surface of leaves and over the surface of the soil, where snails and slugs might crawl. The snails absorb the coffee through their skin and the caffeine in it kills them. Great easy and affordable remedies without harmful poisons, for your garden. Enjoy the lovely spring weather, (cold wind and all), and treasure your garden. Vanoggend toe ek so vaal en grys voel soos ‘n grou, winderige, koue- front Augustusdag, stap ek net na sonop in my tuin en word begroet met die mooiste, potte rose in volle blom. “Irish Luck”, my troosroos, met sy manjefieke, songeel blomme, elk aan die punt van ‘n sterk stam, wink my nader. Ek pluk dadelik vier pragtige, rose vir my huis want ek weet die rose sal maklik ‘n week of meer in ‘n blompot oorleef waar almal die vreugde van rose kan geniet. Die ander verrassing, “Green Ice” beloon my skamerig trots met ‘n magdom klein kompakte wit rosies aan elke takkie. Ek pluk dadelik ‘n takkie vol rosies vir my kombuis waar ek die roseprag heeldag kan geniet. Ek weet die rosies gaan van wit na ‘n sagte groen, en later sagte piek kleure verander. Werklik ‘n troos voorwaar. Die ander pure plesier rosie is die “Teddy Bear”, welig in blom, ‘n verrassende, diep oranje-bruin kleur wat later ook nog ‘n sagte lila skynsel ontwikkel. Wat ‘n kleureprag. Ludwig, van Ludwig’s Rose, sê dis okei as jy nog nie jou rose gesnoei het nie, dit kan nog gedoen word. Voeg net ‘n graaf of twee goeie, grond om die roosplante en bedek met droë blare, of ‘n komposdeklaag . Gee goed water. Onthou, die rose gaan nou in ‘n verwoede groeifase. Stut jou standaard rose met ‘n houtstut of geskikte metaalstut en bid die plant aan die stut met stroke ou sykouse, of stroke skadunet, net die draad nie. Voeg so 30 gram voeding (5:1:5) rondom elke roosplant. Spuit met ‘n insekdoder en fungussprei sodra die nuwe groei begin wys, (so teen die einde van August) om onverwagte infestasies van onwelkome goggagaste en siektes te voorkom.